Thanks to new edge virtual server infrastructure (edge-VSI), organizations can now consolidate storage considered impossible to consolidate due to the response time requirements of branch-bound applications that rely on local storage. 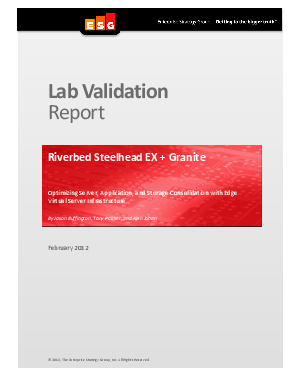 This ESG Lab report examines the Riverbed® Steelhead EX + GraniteT appliance, which delivers a powerful combination of wide area network (WAN) optimization, a virtual services platform, and innovative block-storage optimization to help organizations consolidate servers and storage and deliver IT services globally, while ensuring the performance required in remote and branch offices. Download this informative report now to find out how edge-VSI can improve your IT infrastructure.